Since playing Potion Explosion last year, the game has become one of our family favorites. The mechanics are easy to learn and it’s become a gateway game for some of our friends over the past couple months. In February Asmodee Digital released Potion Explosion for Apple and Android devices. I was actually in the beta test for this game in the Fall of 2016 and the finished product is fantastic! So why does our family like this game so much? The mechanics of Potion Explosion feel a lot like some of the games that we have on our smart phones already. That makes it so easy to see this game on a digital platform. The Potion Explosion app carries the same rich theme and feel of the board game and makes it easy to take with you. The app allows you to play single player against the AI, up to 4 players on one device or online using an Asmodee digital account. I’ve got to admit that the AI opponent is brutal. I’ve played about half a dozen games against the easy mode and barely squeezed out one win. I haven’t even attempted the more difficult AI. Even though it’s difficult, playing against the AI will make you way better at this game. Just be ready for the beatings. Our family loves the pass and play feature of the game that allows up to 4 players to play on one device. On my Android device, the screen flips when the phone is situated right side up or upside down. The game flows well and it’s great having one of our favorite games available in our pocket at all times. If you want to play online, setting up an Asmodee account is pretty simple and allows you to play without having to be in the same location. Potion Explosion is a premium game. The components and parts to this game are very well made and this is why the game has an MSRP of almost $50. 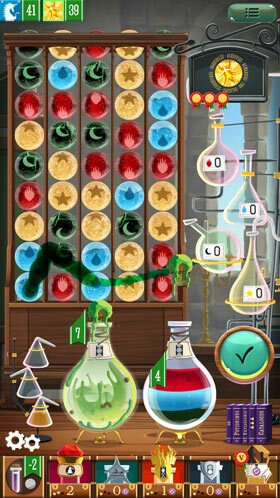 The Potion Explosion app gives you the same mechanics and is a load of fun for less than $5! I don’t keep many games on my mobile device, but Potion Explosion is one that I don’t have any plans to delete. If the physical version of this game has you interested, buying the app is a great way to dig in and get a feel for the game. I love that I can take this experience anywhere I go. This board game would never work in a car on a long trip or sitting on a bench in a park. These are the places where the Potion Explosion app absolutely shines. Purchase this game on the Google Play store or on the Apple App store today. We are giving away a free download of the Potion Explosion app on the Android platform. All you need to do is answer this question in the comments below. What board game would you love to see on your mobile device? Answer in the comments below and we’ll pick a winner at random on Monday March 6th.